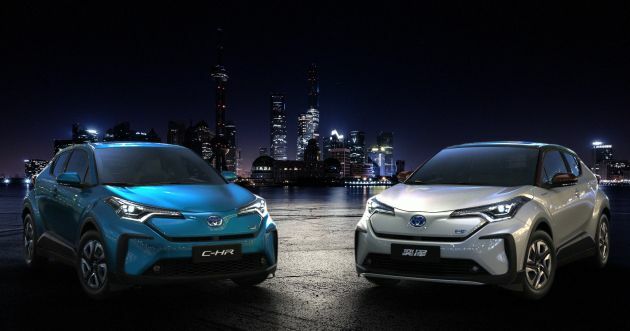 Toyota has revealed the C-HR and Izoa electric cars at Auto Shanghai 2019. The battery-powered duo are based on the Toyota C-HR and will be the first electric vehicles to launch in China under the Toyota brand. Why are there two of them? It’s quite normal for brands to sell two of the same cars in China – with slightly revised styling and unique names – one for each local joint venture company. In this case, one’s for GAC-Toyota and the other for FAW-Toyota. Sales of the C-HR EVs will start from 2020. Toyota did not release tech details, but from the promo video, we can see that the battery pack is mounted on the vehicle floor, in the centre of the car, which is good for reducing the centre of gravity. The little electric motor sits where the internal combustion engine would in the normal C-HR, powering the front axle. No supplementary motor for rear axle AWD. As for design, the EV is still immediately recognisable as the funky C-HR, but it also manages to appear unique. This is thanks to the closed-off nose section. The headlamps are no longer joined to the Toyota emblem by black trim, and there’s a slim letterbox vent in the middle of the fascia. Vertical elements on the sides of the bumper give the face a wide and square jaw, and there’s an EV badge prominently displayed. On the sides, you’ll find an “Electric” logo on the front wings where the “Hybrid” badge sits on the C-HR Hybrid, just below the A pillars. The two-tone wheels appear flat and eco, and aren’t those three-stripe LED tail lamps nice? The C-HR is seen here in its signature blue, while the Izoa is dressed in two-tone pearl white with a copper coloured roof. 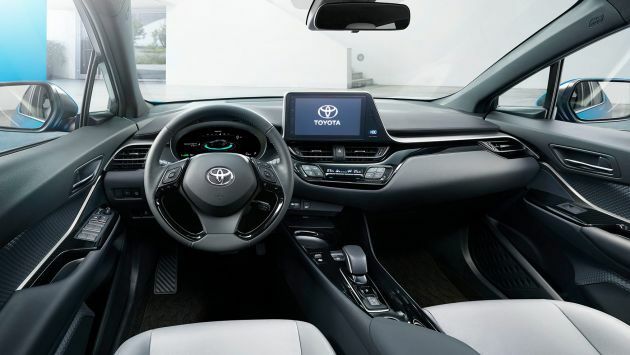 Inside, the changes are as expected – a fully digital instrument panel with EV-related graphics replace the twin-barrel dials of the ICE car. Similarly, the conventional gear knob of the regular car has been swapped with a lever-style item. The video shows a drive mode switch that allows the driver to toggle between Comfort, Normal, Sport, Sport + and Custom modes. Beginning with the China debut of the C-HR and Izoa EVs, Toyota plans to roll out more than ten full electric models globally during the first half of the next decade. Earlier this year, Toyota and Panasonic agreed to establish a joint venture in 2020 to manufacture batteries for EVs.